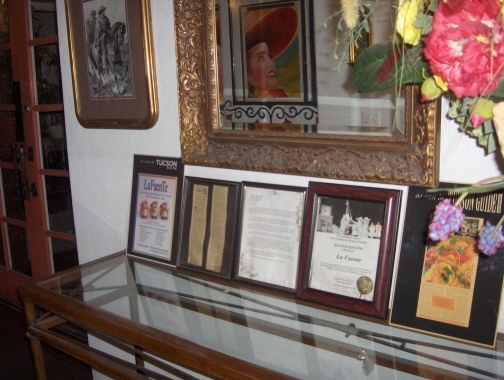 It is quite impressive to note how long some of Tucson's Mexican restaurants have been around. In the case of La Fuente, it has been operating (I assume at the same location) since the 1960's. The section of Oracle Road on which the restaurant is located has apparently seen better days, and looks much like other highways that were bypassed by the Interstate highway system. La Fuente, though, maintains a large amount of business, and other businesses along the street are experiencing their share of business as well. On my initial visit to La Fuente I noticed almost as many out of state vehicles in the parking lot as local ones, including patrons from Mexico. I am not quite sure what all of this means except that the restaurant has an appeal that goes well beyond the local area. Tucson is known for its large population of snowbirds in the winter, but any seasonal residents who frequent La Fuente have apparently developed a taste for true Mexican food. I studied a lot of the restaurant review web sites to determine which ones out of Tucson's many Mexican restaurants I should visit first. Surprisingly, I do not think any of them mentioned La Fuente. Perhaps one reason for this is that La Fuente is not "new and hip" like some of the other restaurants, and perhaps it has been overlooked because it located away from "Mexican restaurant row" in South Tucson. Thanks to Brian Wingert's recommendation of La Fuente, though, I think I have discovered one of the premier Sonoran style restaurants in Tucson, and perhaps in the State of Arizona. Brian, a former resident of Tucson, states that it would be difficult to find a Mexican restaurant in the city with better food, and so far I have to agree. I know that Sonoran cuisine should be judged on its own, and not compared to New Mexican or other regional styles of Mexican food. With flavors as rich as I found at La Fuente, though, it is hard not to compare it to some of El Paso's best restaurants. Sonoran food is made with different spices and it developed in a different tradition, but in terms of quality I think good Sonoran cuisine is every bit as satisfying as other styles of Mexican food. Sonoran food is certainly not as spicy as the border cuisine from the state of Chihuahua, but in the hands of expert cooks, as at La Fuente, Sonoran cuisine can have the kind of flavors that compensate for a limited use of chiles. Mole is supposed to be the signature dish at La Fuente, so it was something I had to try. The Chicken Enchilada with Mole turned out to be one of the best I have eaten. Other moles I have tried in Arizona tasted weak to the point I would almost describe them as "washed out." The one here, though, was dark with the right texture (not too thick and not too runny) and the type of flavor I associate with good mole. I thought it tasted very similar to the two moles that I consider to be the best in El Paso: the ones at Carnitas Querétaro and Barrigas. The spices were slightly different at La Fuente, but it was just as good. For those who truly like mole as I do, I think it is worth tasting the subtle differences between the Sonora, Chihuahua, and central Mexico versions. La Fuente does not serve other types of mole that originate in southern Mexico, but the dark brown mole poblano made here is the classic style with the owner's own twist. For variety I also ordered an Enchilada Suiza, a classic green enchilada with sour cream from central and northeastern Mexico. As can probably be seen in the photo, the sauce was not really green, and in fact did not have much in the way of chiles, puréed or otherwise. The way it was flavored, though, made the most of a mild enchilada to the point that I almost thought it was better than the mole enchilada. In any case, I would have enjoyed a plate of either type of enchilada. The sour cream was excellent, and overall the enchilada was quite good. Both the cheese and the chicken used at La Fuente were excellent. The cheese looked like a mixture of white and yellow varieties, and I believe this is typical of Sonoran food. The high quality chicken at La Fuente was one of the main factors that made it a better experience for me than El Charro (the mole was the other thing that was much better here). Beans and Rice were both very good. I enjoyed the small salad La Fuente served on the plate with a tangy dressing. The thick Chips were so outstanding they were noteworthy as being among the best I have eaten. There are not many in El Paso, or any other city, that are better. The Salsa was thin with a brown color that I thought I could come to appreciate over time, but which was somewhat disappointing after the New Mexico style salsa that was served at El Charro. The salsa was not spicy, and was something that probably anybody could eat even if they were not used to spicy Mexican food. The food at La Fuente was only mildly spicy, but it certainly did not taste "dumbed down" as I have found in some restaurants that have been Americanized. 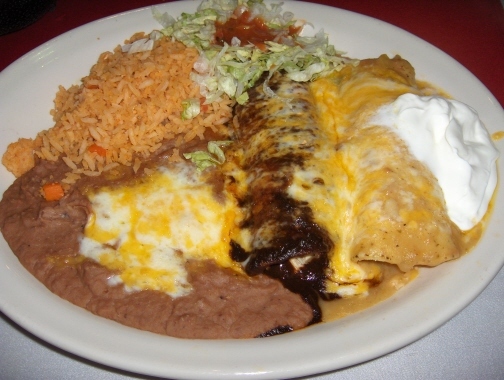 Based on the flavors, I would say La Fuente is about as authentic a place for Sonoran food as can be found in the United States (although I would not claim that it is the best that can be found without trying enough other restaurants to get a comparison). I have sampled enough of La Fuente's food, though, to know it is one of my favorites.